In its basic form, a fiduciary relationship states that a financial advisor acts always in the best interest of the client. Most investors believe they have a fiduciary relationship with their advisor, even though most financial advisors are not required by law or regulation to act as a fiduciary for their clients. In Spectrem’s newest research report - Advisor Relationships and Changing Advisor Requirements – the disconnect between investors and advisors in regards to a fiduciary relationship is examined. Specifically, the report shows just how widespread is the belief that the investor-advisor relationship includes a fiduciary duty, which it may not. Spectrem’s quarterly reports look at investors in three different wealth segments, and the wealthiest is the Ultra High Net Worth investor, with a net worth between $5 million and $25 million. Among UHNW investors, 89 percent say they know what a fiduciary relationship is, and 80 percent say their financial advisor is a fiduciary. Investment advisors who are subject to the Investment Advisors Act of 1940 must place his interests below that of his client. But a majority of individuals who identify themselves as financial advisors are not subject to the Investment Advisors Act, although they may still act as a fiduciary on their own accord. The Securities and Exchange Commission is considering a change to its current regulations that would legally tie the word “advisor’’ to the word “fiduciary”. That was a suggestion included in the Dowd-Frank Act of 2010, but Congress left it to the SEC to decide whether to implement it. UHNW investors have a varied opinion as to what constitutes a fiduciary relationship. Eighty-three percent of UHNW investors believe a fiduciary relationship is a legal one as well, while 67 percent said it means the advisor is looking out for the client’s best interest. Forty-nine percent believe a fiduciary relationship is based on confidence, trust and good faith, while 24 percent said it a relationship of extreme loyalty. 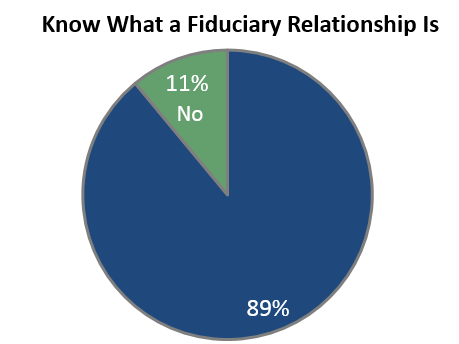 Only 82 percent of advisor-dependent UHNW investors say they know what a fiduciary relationship is, which is potentially unfortunate for the investor, since they are dependent upon the advisor for all investment decisions. On the other hand, 92 percent of event-driven investors, who only use advisors when necessary, say they understand the meaning of a fiduciary relationship.